I did a blog not too long ago that was about living in Tempe. There's a lot to do that's close to the UAT campus. Within walking distance, the Arizona Mills Mall is home to a whole bunch of outlet stores. One particular place to go in the mall is GameWorks. GameWorks is like a cheaper version of Dave and Busters. If you are familiar with the eat and play arcade games scene, this is just that. You can buy a set number of "coins" or points that are put on a card that you can use to play all of the games they offer there. GameWorks has a whole bunch of different types of games for you to choose from. They have anything from racing to DDR. Yesterday night my group of friends and I went out to GameWorks after my friend Ash got off work around 9. We stayed there playing all kinds of games until about 11:30! Some of us were playing the music games, while others were playing racing. About four of us ended up playing their basketball games most the night. You can group together and all play in a competition to see how many points you can get. We played this most of the night. Even after all of our arms were super sore, we kept playing. 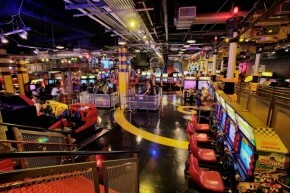 GameWorks is something that is really great for you an your friends to do while you're here at UAT. It's super close, and they have great daily deals!